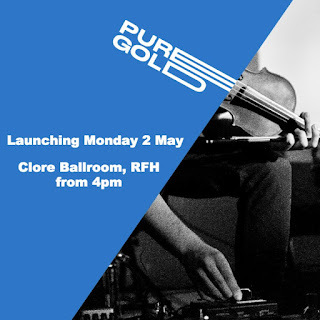 Goldsmiths, University of London, launches its festival, PureGold 2016, at the Clore Ballroom in the South Bank Centre on Monday 2 May 2016. From 4pm there will be a chance to preview the college's annual celebration of the eclectic, innovative and exciting music coming out of Goldsmiths. There will be two stages featuring featuring bands and singer-songwriters, choral and piano works, jazz, multi-keyboards and sitar, cutting edge digital manipulation and new instrument devices, plus up-and-coming artists currently featured on the NX Records mixtape. PureGold events, showcasing the talents of the current crop of students, will be going on from May to July across London including The Albany, Deptford, as well as at Goldsmiths, follow @goldsmithsmusic #PureGold16 on twitter for updates or see their website.